Now available for pre-sale with release on July 18! 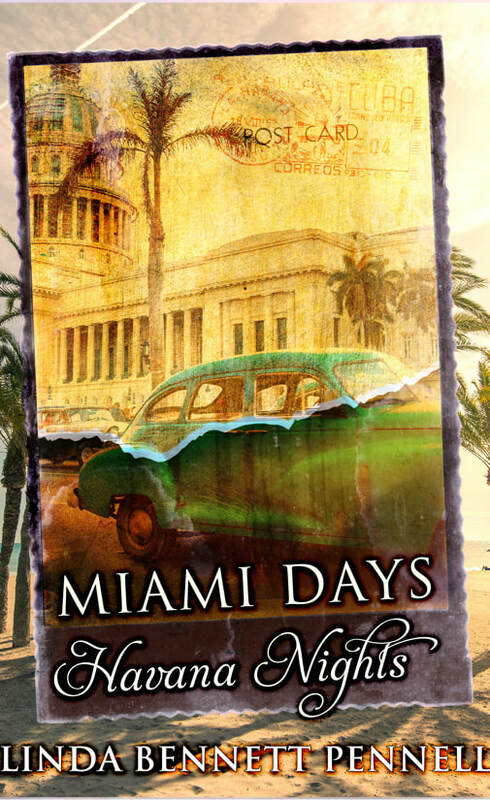 A follow up to Al Capone at the Blanche Hotel, Miami Days, Havana Nights is a dual timeline novel featuring 1920’s – 60’s gangsters and a present day young, female history professor determined to suss out their secrets. While the novel is more historical fiction than traditional romance, a love story also winds through each timeline. After all, what would life be without someone to love? Knocking - sharp, loud, rapid - echoed through the empty speakeasy. Sam froze, the notes of a tune stuck in the roof of his mouth. He leaned the handle of his push broom against his shoulder and glanced toward the entrance. It was late, too late, to be admitting customers, even for the city’s illegal watering holes and gambling joints. Although a crossbar and several locks protected the heavy iron door, an uneasy feeling crawled down Sam’s spine. Growing tension over control of the Fulton Fish Market, in fact the entire Lower East Side, was making a lot of people jumpy, including him. Several seconds passed without noise from the other side of the door. Sam let out his breath and chuckled. Working at the fish market in the afternoon then staying up half the night at the speakeasy didn’t leave much time for sleep. It kept him on edge. All the rumors and threats floating around these days weren’t helping either. Cupping a hand around his ear and hearing nothing, he relaxed and gave the broom a shove. Sam’s heart jumped into his throat as puffs of dust settled around his feet. Sam’s breathing kicked up a notch. He looked over his shoulder toward the office. The boss didn’t like being disturbed when he was meeting with his guys. The pounding from outside in the hall returned in earnest, but the office door remained fixed. “You gonna open this damned door or do I break it down?” The doorknob rattled and jerked. Behind Sam, the office door latch clicked. He watched in the mirror over the bar as the muzzle of a .38 Special emerged from the opening, its nickel-plated barrel shining in the overhead lights. A gangster stepped into the room, met Sam’s eye in the mirror, and jerked his head, then the room went dark. Sam dropped his broom and backed into an alcove. The office door opened wider. Several shadows scurried across the floor. Metal locks and bolts snapped and clanked, then the entrance door swung inward. Sam couldn’t see the newcomer’s face, but given the guy’s size, backlit by the stairwell’s single bulb, and his accent, it must be William Mack, the labor organizer. Trying to push in on Socks Lanza’s action at the market was a stupid move. The Irish were losing this war. Heck, they couldn’t even win a battle. The big Mick must have had enough. Sam shook his head. The goy had chutzpah coming here. You had to give him that. Shoe soles scuffled on bare floorboards. The door slammed. The room filled with light again accompanied by groans and the sound of body blows. Sam squinted against the glare and stepped from his alcove, his heart thumping in rhythm with the punches being administered to Mack. Two guys held the Irishman’s arms while he strained and pulled to get free. Another of Socks’ men, a former heavy weight boxer, jabbed and pummeled Mack’s head and mid-section. When his knees buckled, the boxer stepped back, making room for Socks, who strolled over to the bar from the office doorway. “And who’s gonna make me? You?” The sound of Socks’ laughter rolled around the empty room. Socks snatched the pistol from his henchman and took aim, firing once into Mack’s chest. Sam jumped at the pistol’s report. A soft groan floated from Mack. Blood bubbled on his lips. Sam wanted desperately to look away, but he couldn’t tear his gaze from the oozing red stream dribbling down the Irishman’s chin. Sam’s mouth went dry as though filled with cotton gauze. Grabbing a fistful of the Irishman’s hair, Socks pulled back so that Mack had to look him full in the face. Setting the muzzle against Mack’s forehead, Socks grinned and counted to five, then pulled the trigger. Blood and brains splattered over the bar and floor. Socks let go and Mack’s lifeless form toppled over. Sam’s stomach heaved. He gagged on the bile rising from his stomach and covered his mouth with a shaky hand. Sam bent over the body. The metallic odor of the blood covering Mack’s head and shirtfront assaulted Sam as he grabbed the Irishman’s feet. The need to puke made Sam’s head swim, but he refused to give in. As stupid as he had been up until now, he refused to show weakness. No telling what would happen if he didn’t follow orders. Straining and grunting, he and Tino lifted Mack while the others made room for them to maneuver. Socks himself opened the speakeasy door. Sam and Tino struggled down the dimly lit stairwell to the ground floor entrance that exited onto Beekman Street one block east of where the United Seafood Workers Union had their headquarters. Darkness enveloped the neighborhood. The street lamps had been shot out so many times the city finally stopped fixing them. Tino stopped in the entry and peered back over his shoulder. His head swiveled toward Sam and nodded. Together, they moved into the street and turned west. Pain shot down Sam’s back and his arms shook. His breath came in short gasps, as much from terror as from exertion. At the corner, they stopped while Tino checked the cross street. He leaned forward and hoisted Mack’s body a little higher. Tino scurried backward over the curb, nearly pulling Sam off his feet. He stumbled once and righted himself, but dropped one of Mack’s legs. Grabbing a fistful of gabardine, he stumbled after Tino. The sound of the cop’s steps picking up speed and his whistle blasting followed Sam and Tino. When they reached the steps of the union building on the opposite corner, Tino swung the upper body once and let it fly. Sam released the legs as the shoulders thudded on the concrete steps. They needed to get back to the speakeasy, but Sam turned directly into the beam of the cop’s flashlight. He heard Tino running, but he couldn’t make his own feet budge. “Hey, you. Jew boy. Freeze.” The cop jumped from the curb on the opposite side of the street. The dam of Sam’s fear broke, sending a shot of adrenaline through him. He crouched and ran. You’re one stupid S.O.B., Ackerman. You’re gonna get yourself killed for sure, then what are Mama and the boys going to do? Starve and lose the apartment most likely. With shots bouncing off the street’s brick pavers, Sam reached the speakeasy entrance and thundered up the stairs. At the top step, Tino grabbed Sam’s collar and hauled him through an opening. Hinges creaked, followed by the swoosh of a secret wall panel falling back into place. Sam blinked once. And again. Total blackness enveloped him like a musty, suffocating blanket. Footsteps pounded up the stairs on the other side of the wall, setting his heart racing. “Tin~” A rough hand clamped down on his mouth. “Shut up.” Damp breath smelling of whiskey floated against Sam’s cheek. Loud knocking accompanied by shouting and a door slamming filled the cramped space. With his free hand, Tino pushed Sam’s face against rough brick. Something scraped softly, then a narrow shaft of light poured into the closet sized room. Sam placed his eye against the peephole. Two of Socks’ men stepped forward. The cop’s head swiveled from one to the other. Officer O’Hara took two steps back and turned on his heel heading for the entrance. When the sound of footsteps faded, Tino removed his hand from Sam’s mouth. “The cop saw me. He recognized me.” The tremble in Sam’s voice made him ashamed. Punching Tino would feel really good, but Sam couldn’t handle more trouble than he already had. He opened his mouth to ask what would happen next, but something metal clicked behind him. Tino put a finger to his lips. Sam’s heart jumped into his throat, then raced like it might explode. “I’m sorry, Mr. Lanza. I was so scared I couldn’t move. I’ve never done anything like that before.” Sam’s knees knocked together in danger of buckling altogether. Sam’s hands shook. He didn’t even try to stop them. When he didn’t move, Tino gave him a shove from behind. Sam stumbled from the secret hole and shuffled across the space separating him from the boss. “Two years, Mr. Lanza. Since I was fifteen,” Sam gasped. The room began spinning. Sam shook his head. Words refused to form. Sam’s heart raced so hard he became dizzy. Images of Mack’s blood covered body danced around his already addled mind. What would happen to Mama and the boys? They wouldn’t even know what had become of him. It would be like he never existed. A metallic taste filled Sam’s mouth. His knees buckled. Everything went dark. Hands shaking Sam’s shoulders brought him back. He opened his eyes and squinted in the glare of overhead lights. Dust from the floor swirled up his nose, making him sneeze. He sat up and rubbed a lump on the back of his head. The group bending over him laughed and nudged each other.